Dinosaur Comics - April 2nd, 2014 - awesome fun times! 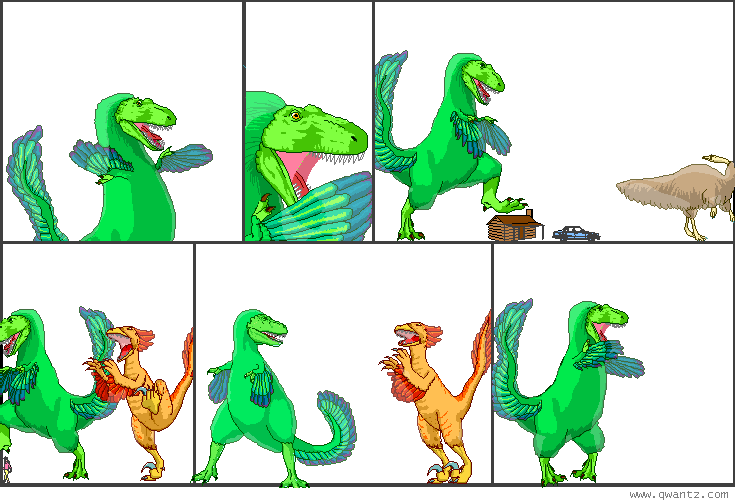 April 2nd, 2014: OKAY YES changing Dinosaur Comics to a comic where the pictures constantly change was only for April Fools' Day, I GUESS. I guess this is why all those tech companies test the waters by launching new features on April 1st, huh? You can play off your hopes and dreams as a joke. If you want to recreate this experience, add "&butiwouldratherbereading=onaprilfoolsday2014" to the end of any qwantz comics URL, or, to recreate it EVEN HARDER, add "&butiwouldratherbereading=somethingthatwilldestroymybrain". There are a bunch of other overlays too! If you are vision-impaired in the way that means reading black text on white is tricky, there's also a "white-on-black" inversed version (assuming your browser supports it: Chrome does). Turns out this feature has legitimate uses!